Beautiful colors mingle in a wide bracelet by Addo Zakour in Ghana. Working with sese wood beads, she knots them by hand on nylon cords. This festive bracelet slips over the wrist to make every day a celebration. While this bracelet is pretty in the picture it's so much prettier in person. The colors are rich and would go with any outfit. It is so whimsical it makes me happy just wearing it. I can't believe the beauty of this item. I am proud to wear the bracelet from Africa. Very colorful and well made-can't wait to wear for Montana summers!Thank you for your lovely work?? This is a beautiful bracelet. A lot of time had to go into making it, carving and colouring each little piece. I am very proud to wear the work of this beautiful artist. When people ask me about it, I tell them about her and how they can become a KIVA donor. I am buying more for gifts. I wanted something colorful and dainty. It is as beautiful as it appears. I love my bracelet. I bought this bracelet to go with your brightly beaded bamboo button necklace and a Rita Addo Zakour soda bottled beads necklace. The colors are are terrific match however I've remembered why I don't wear a watch. It will only be worn for special occasions. Does the artist do necklaces ? 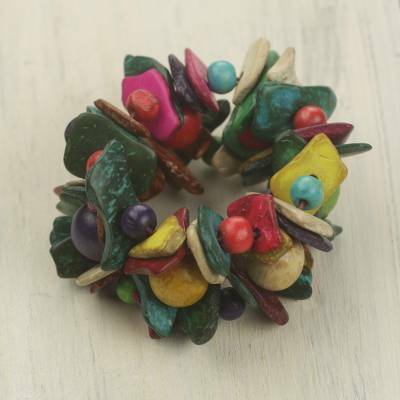 "Thisis now a favorite piec of mine"
Very colorful and interesting bracelet. Unique style. This was a gift for my niece, and she loves it. In fact, her sister loves it, too, so I guess I should have bought another!